There are 2.18 billion Christians around the world, up from about 600 million in 1910, according to a 2011 study by the Pew Research Center’s Forum on Religion & Public Life. But the world’s overall population also has risen rapidly, from an estimated 1.8 billion in 1910 to 6.9 billion in 2010. As a result, Christians make up about the same portion of the world’s population today (32%) as they did a century ago (35%). 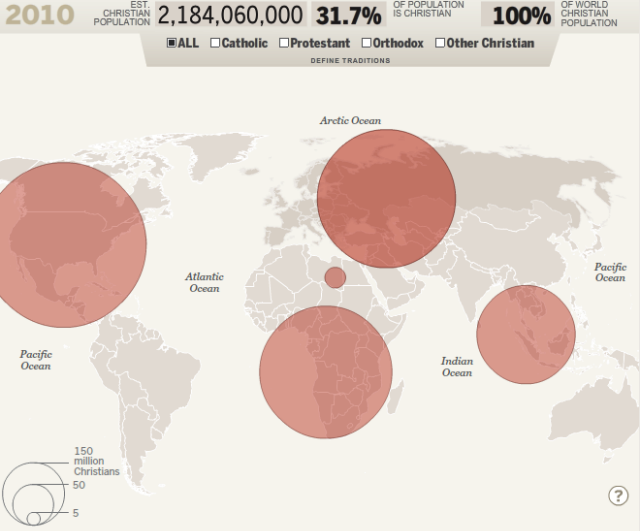 Taken as a whole, Christians are still by far the world’s largest religious group. Muslims, the second-largest group, make up a little less than a quarter of the world’s population. This apparent stability in the percentage of the global population that is Christian masks a momentous shift. Although Europe and the Americas still are home to a majority of the world’s Christians (63%), that share is much lower than it was in 1910 (93%). And the proportion of Europeans and Americans who are Christian has dropped from 95% in 1910 to 76% in 2010 in Europe as a whole, and from 96% to 86% in the Americas as a whole.